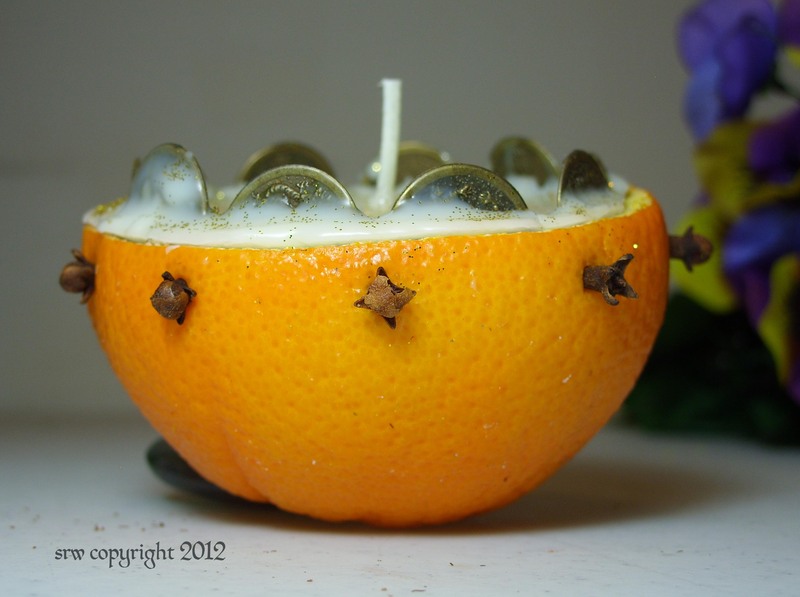 Use the Shell of an Orange, Lemon or Grapefruit to make an Amazing Prosperity Candle! 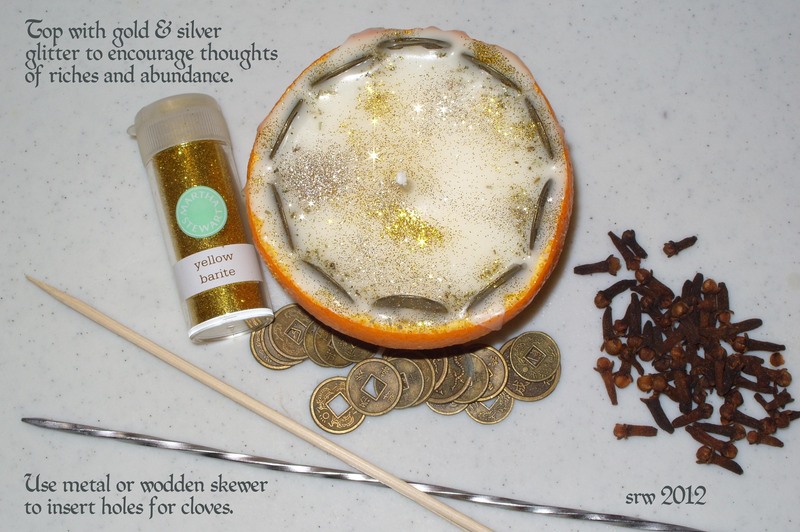 As I hummed the chant the other day when pouring candles, I thought, “Why not use an orange shell to punch up the power of a prosperity spell?” Add a few Chinese good luck coins, grind in a bit of prosperity powder, sprinkle the top of the candle with gold and silver glitter to match the chant, and…ta-da! 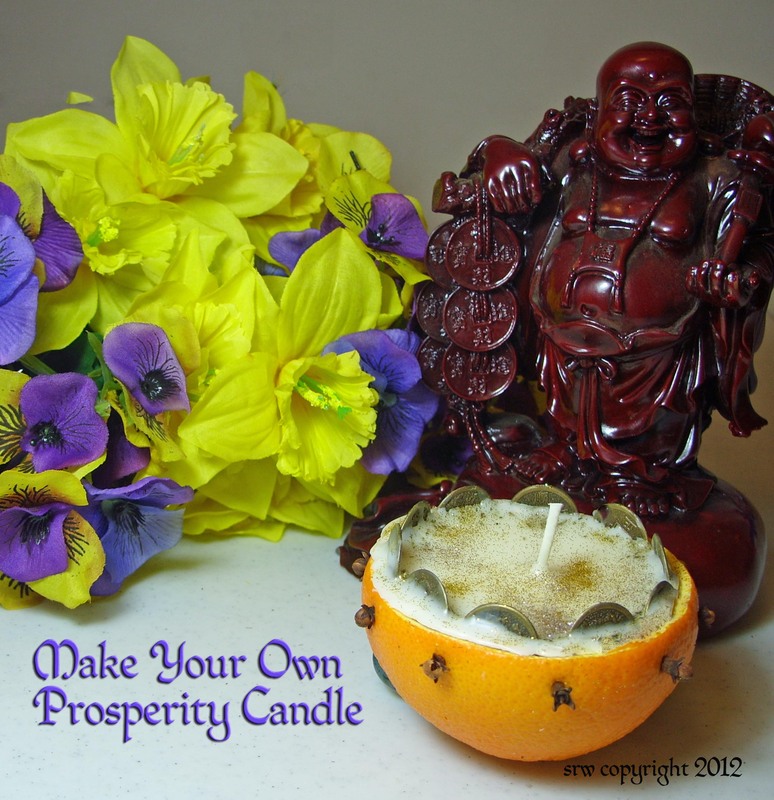 Super charged prosperity candle! Candle wax of your choice and appropriate equipment: I used soy because it requires only one pour and doesn’t sink. You can purchase microwaveable soy wax at your craft store, which eliminates muss, fuss, and extra equipment if you are not a candle making enthusiast. Most brands are an easy clean with soap and water. 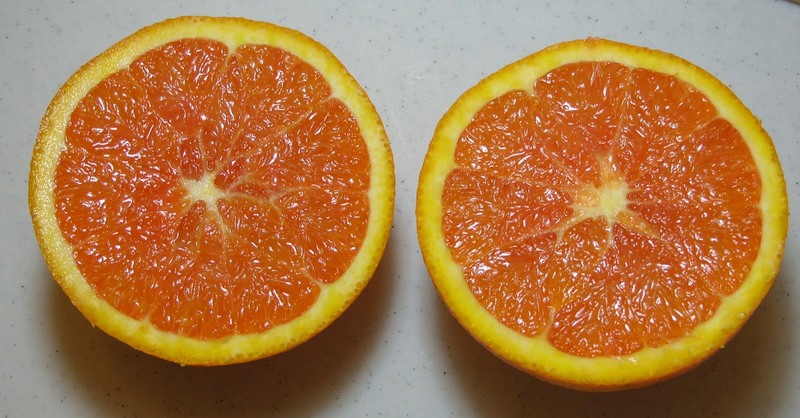 Choose an orange that will sit evenly on a flat surface. Step One. If the candle is for magickal work, cleanse and consecrate all tools, herbs, etc. in the manner in which you are most comfortable. 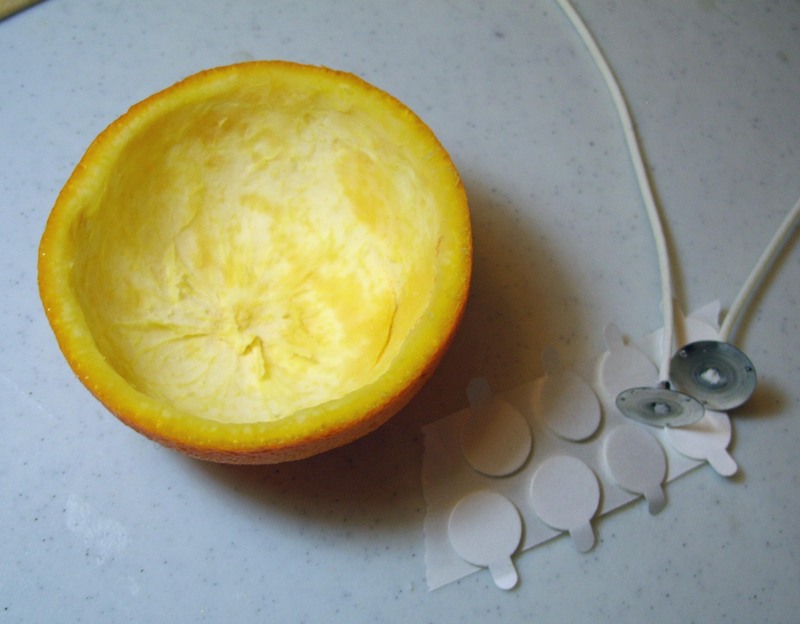 When you are ready, cut the orange with a sharp knife. Pat the inside of the shell as dry as you can with a paper towel. Affix wick to the bottom center of the orange shell. Step Four. Affix wick tab to wick bottom. 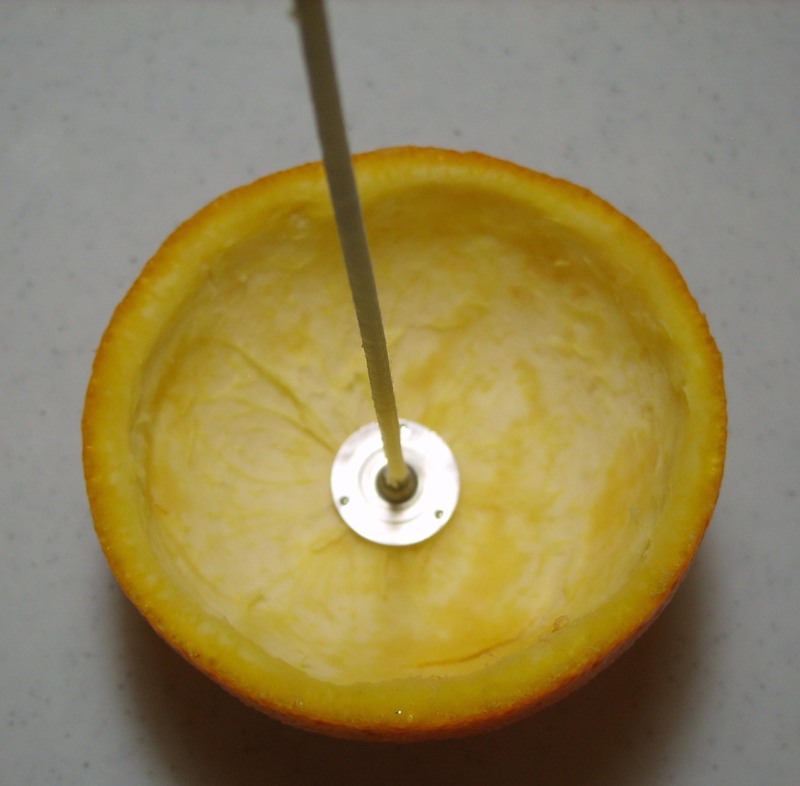 Place wick in center of orange shell. You can also use a glue gun for this step. As the orange shell was still a bit damp when I placed the wick, it tried to slip a bit, but remained stable during the pouring process. Step Five. Heat wax according to manufacturer’s instructions. Add color and scent according to product instructions. In the example candle, I chose to use the natural color of the soy. 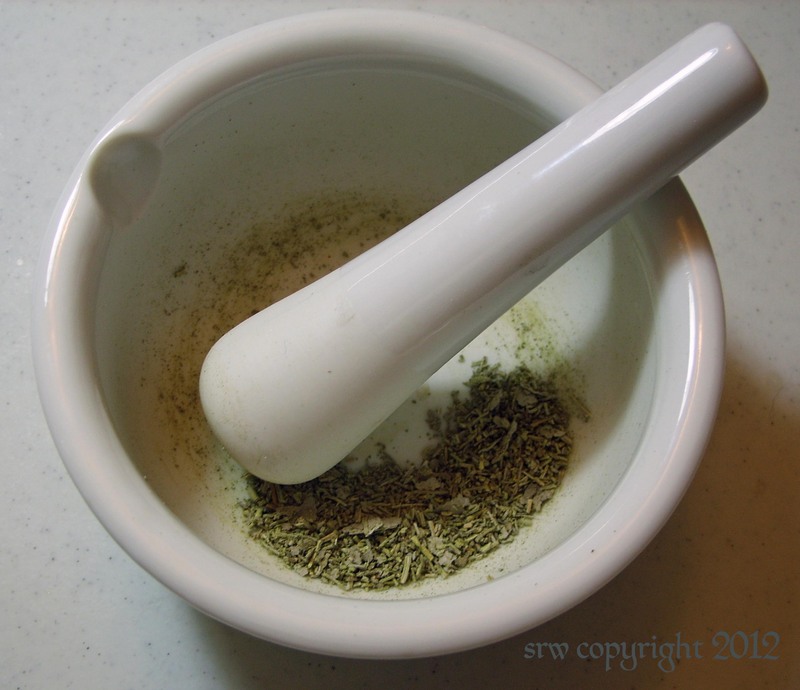 While the wax is melting, grind any herbs you wish to add to your final blend. Remember that whole herbs tend to make candles unpredictable. To ensure a safe burn, I always powder the herbs and use only a small amount of the powder in the brew. Again, this is your choice. Mint, cinquefoil, and chamomile are great herbs for a prosperity candle. You can also add patchouli! Step Nine: Sprinkle edges of candle (away from the wick) with your empowered herbal powder. Add gold and silver glitter. Allow candle to cool completely. 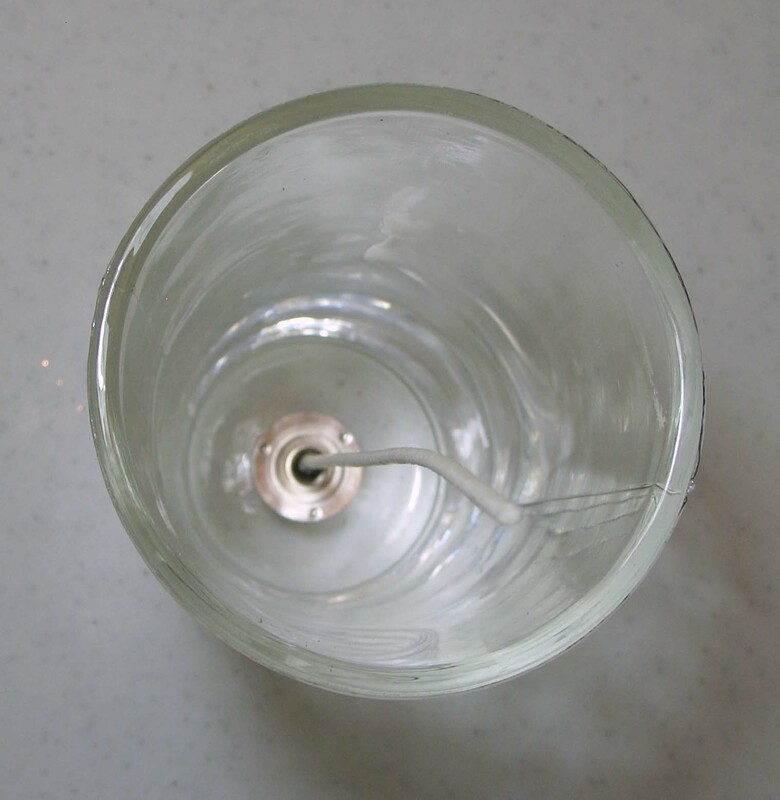 Quick, Easy and Inexpensive -- You Can Make a Powerful Water Candle in Five Minutes! Can’t afford expensive candles or just want to go the primitive route? 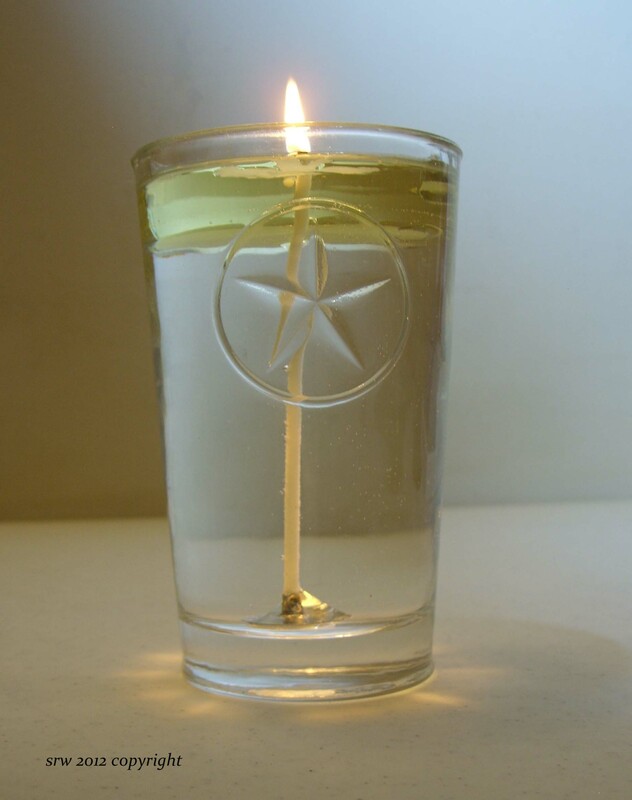 Here’s an inventive candle idea that requires only water, wick, and good old fashioned cooking oil! 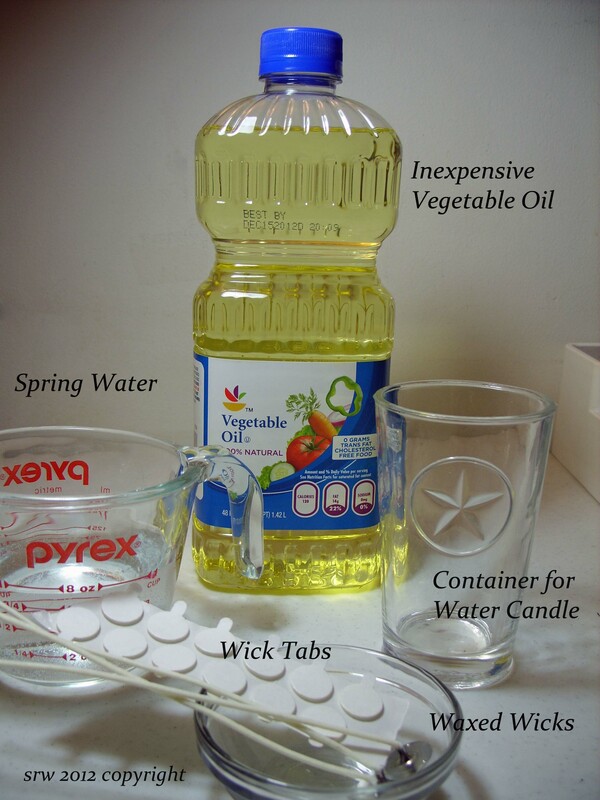 Water, Wick, an interesting container, and cooking oil -- who'da thought this could make a cool candle? Waxed wick to match the diameter of your container — this is very important. 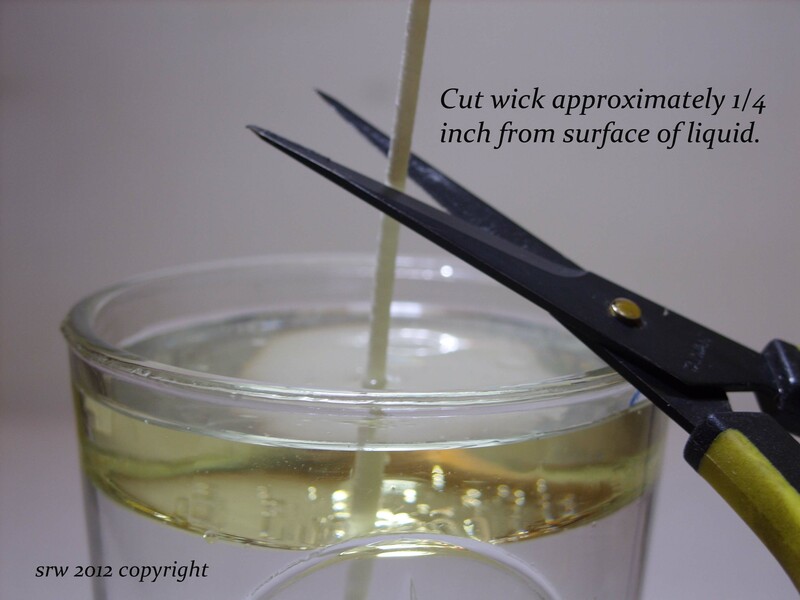 If the wick is too small for the width of the container, your wick will drown in about an hour. Optional: Fresh herbs, gemstones, and other objects can be placed in the water before adding the oil. 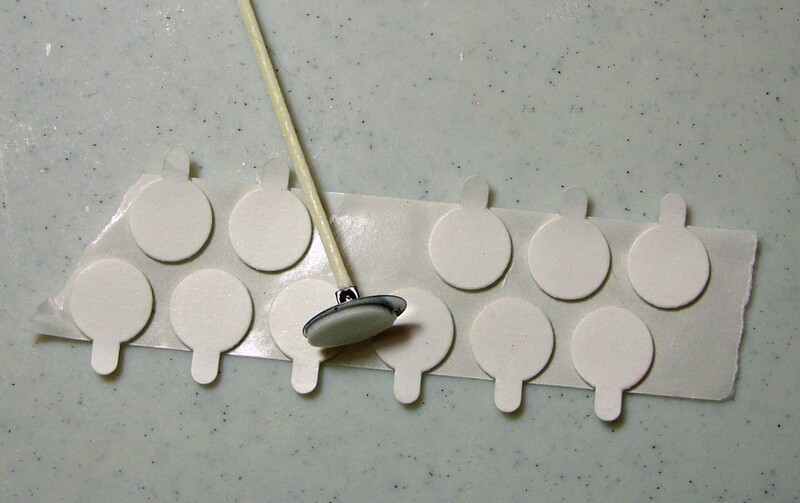 You can use a convenient wick tab or a dab of glue from a hot glue gun. Step One: Affix the wick tab to the wick, or if using a glue gun, go directly to step two. Center the wick in the bottom of the container. Step Two: Affix wick to inside bottom center of container. If you are using fresh herbs or gemstones, add them now. A picture of this type of Spirit Candle is shown below. Step Two and a Half: No kidding. If you wish to banish something from your life, add a little salt to the water. If you wish to attract particular energies, add a pinch of white sugar. For example, if you need prosperity or good fortune in your life, add a little white sugar to the water and stir gently before pouring into the container. Step Three: Fill container with water leaving about 1 inch space at the top of container. You need this space to add the oil and prevent container from overflowing should you wish to carry your Spirit Light somewhere. Step Four: Think of your favorite prayer, chant, or blessing charm and intone it over the water while holding the container. Your words can be a simple blessing, or an incantation for a particular spell. When you are finished with your blessing or charm, blow over the surface of the water three times. This is to instill the holy breath of Spirit and attune you more closely to the spiritual energies of the universe. 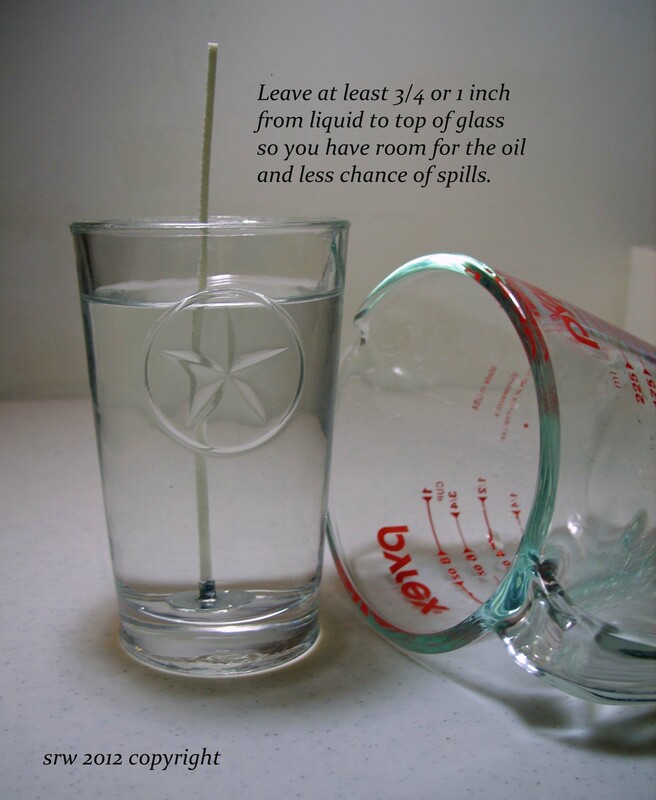 Pour approximately 1/4 inch of oil on top of water. Step Five: Pour 1/4 inch of cooking oil on top of the water. Don’t worry, it will rise to the surface in a few seconds. This 1/4 inch of oil will give you an approximate thirteen hour burn. 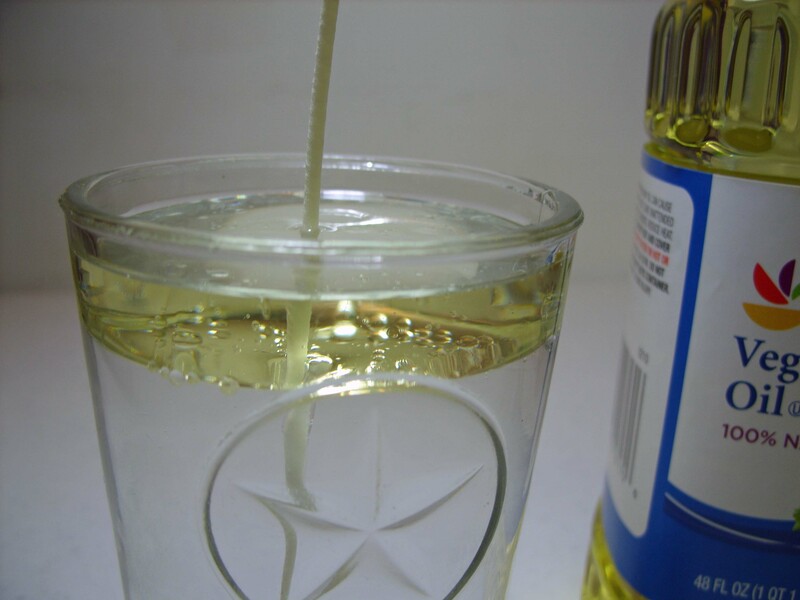 Step Six: Cut wick to 1/2inch above the surface of the cooking oil. The longer the wick, the bigger the flame so be careful that you don’t leave the wick too long. Conversely, if the wick is cut too short, your flame will drown. Your Spirit Candle is now ready for use. Just light the wick! We used a Spirit Candle like the one pictured below in our healing circle. The power went out all over the valley; but, we had plenty of light to continue our working thanks to our Spirit Candle! You can also use your Spirit Candle in dedication to a particular deity. 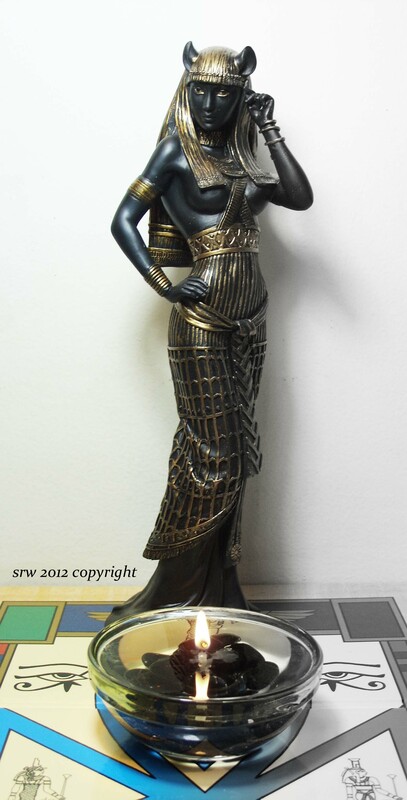 In this picture, a request was made for the protection of the Goddess Bast. 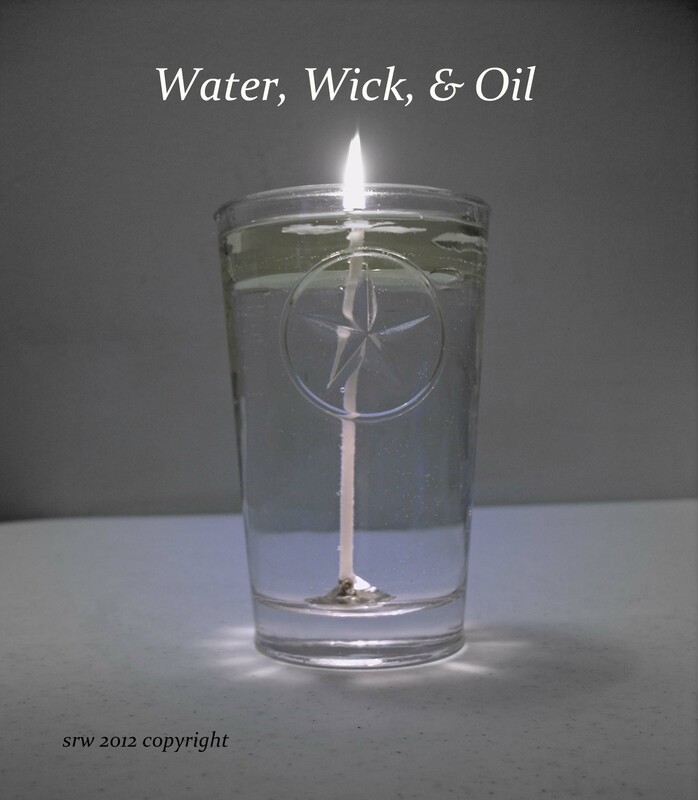 Employing the elements of empowered water and fire, your Spirit Candle can be used for all types of magicks, spells, rituals, or meditations. Like the more Heathen approach? 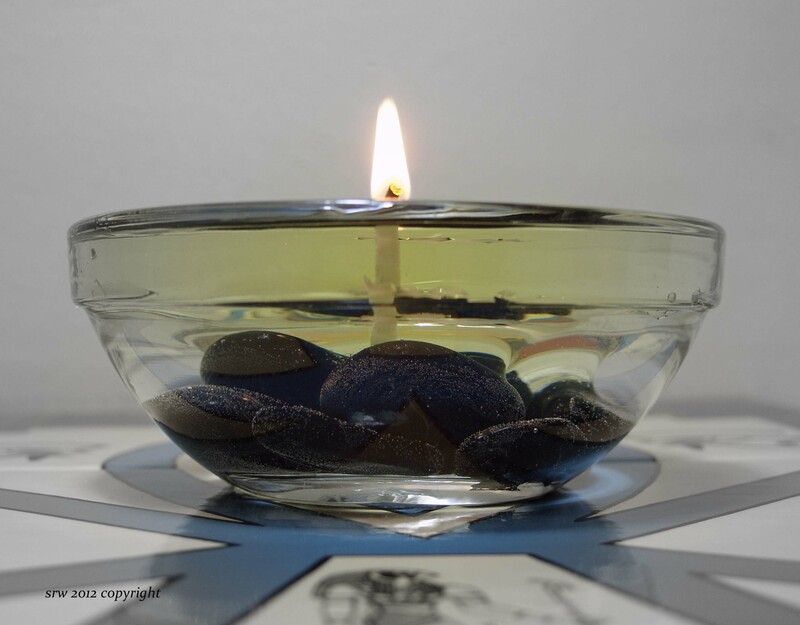 Add ice to your Spirit Candle and place container over your favorite bindrune. Just be sure you leave enough room in the container to accommodate the melting ice. Whether for pleasure, necessity, or magick, a Spirit Candle is particularly powerful because you made it yourself!